Billie Joe appears as himself in the upcoming film "This Is 40"
This is a little bit out-of-the-blue (or way out-of-the-blue), but we just found out from multiple credible sources that Billie Joe appears as himself in the upcoming comedy movie, "This Is 40." We first found out about this from a fan who saw an advanced screening of the movie, and mentioned Billie Joe's "multiple cameos" to us on Twitter. If this wasn't proof enough, the IMDb movie database's cast list for "This Is 40" also mentions Billie Joe. 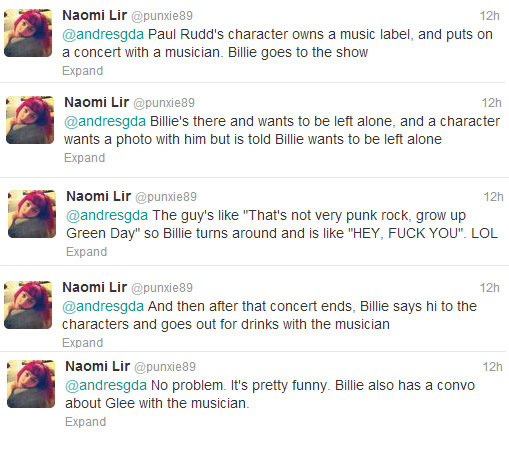 @punxie89 told us on Twitter that the film's characters come across Billie Joe at a party in the music industry and speaks a couple lines. I don't want to spoil it for people curious, but if you want to know, check out punkie89's description. The movie will be in theaters this Friday, December 21st, for those of you who want to go check it out for yourselves. After a bit of research, I found that filming for "This Is 40" lasted all the way from January to early September in Los Angeles. Tough to say when Billie Joe did his part.